As a new or upcoming professional, the worst thing you could ever hear is that you are trying to join a profession on the verge of extinction. After years of focus and goals set on becoming a SA practitioner, it seems unfathomable that as our economic climate starts a slow comeback that we too could join the unemployment line with so many of our fellow students and constituents. The threat dawned on me today as I was getting some take-out for lunch. As I was leaving the establishment, I noticed a real estate sign in the window of a local frozen yogurt shop that our entire cohort enjoyed while in graduate school at Ball State. 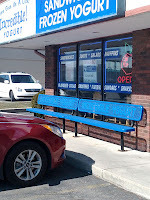 Rarely was this Froyo shop not packed as it had affordable prices and was welcoming to the entire community. 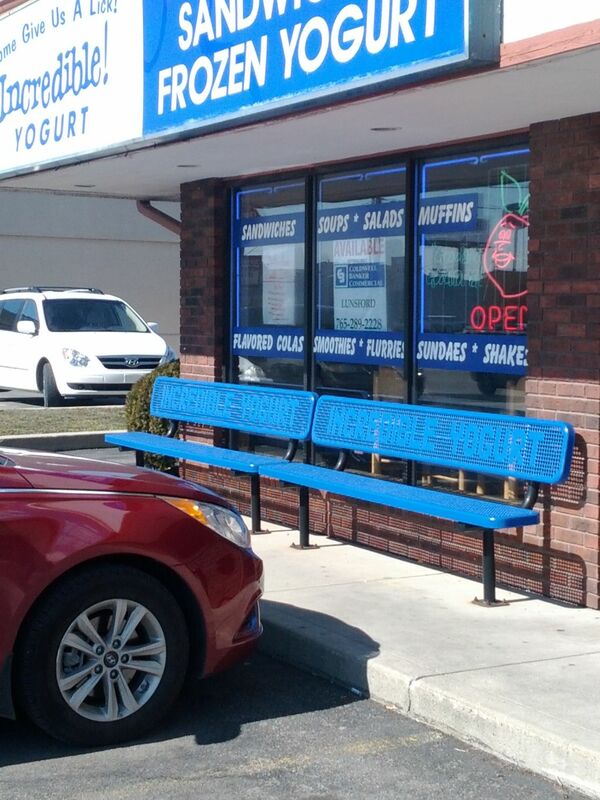 Within the past year, however, a larger, flashier frozen yogurt joint has popped up closer to campus and I fear that part of this potential sale may have to do with the new competition in the neighborhood (hopefully not). This struggle against competition for resources and customers reminded me of the battle we currently wage in Student Affairs. We are not the department that alumni flock to provide donations to keep us afloat. We are not the segment of campus life which is deemed essential by our state legislatures. Heck, half of the time we have to struggle for resources on our own campus where our success stories are well known! Merely six or seven years ago when I first started thinking about Student Affairs, those around me were freely going to graduate programs of their choice, or even going directly to work in professional positions straight out of their undergraduate program or degree. By the time I actually started my process, however, this had changed significantly as budget cuts started to run rampant, harsh economic times forced senior leadership to not retire because of the uncertainty of their retirement funds, and more college graduates were left without jobs after four years of hard work. This chain reaction has pushed more students to enroll back into school to pursue graduate degrees. So how are we to avoid getting a foreclosure sign? The answer is easier said than done. In my opinion, to thrive we must continue to measure our impact through assessment, continue to motivate, innovate, and accommodate, and strive to further educate those around us as to the importance of our field. While the focus is highly quantitative at this time, I feel that we must find other ways to prove our worth outside of the statistics. A quick snapshot of the current political campaigns demonstrates that even hard facts can be manipulated by pulling on the heartstrings of those around you. For SA to remain successful, we need for our leaders to continue and mold the lives around them. They must continue to work long into the evening when other professions have clocked out and gone home. But most importantly they need to voice these stories to the public. 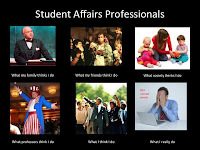 You have all been inundated with meme’s within the past few months, many of which relate to Student Affairs and how people perceive our profession. 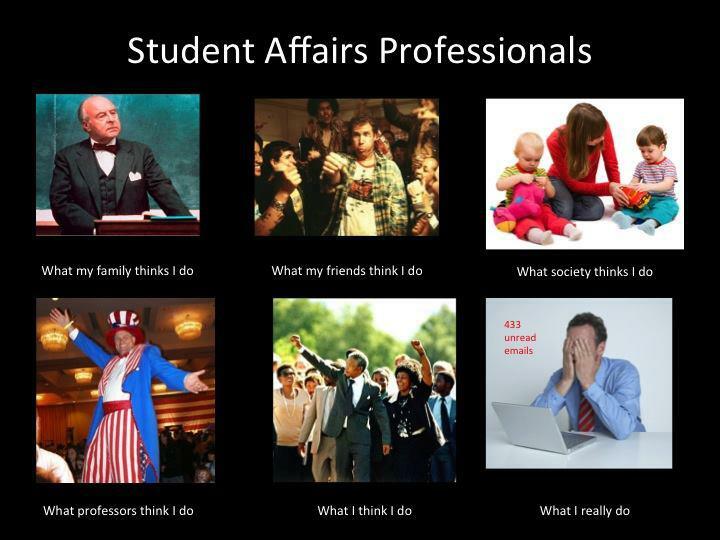 While taken as humor, many of these are an accurate snapshot of our profession. How are you going to voice the greatness of our profession?